Helping you find wellness one step at a time. Just how much water should you drink? As a chiropractor I frequently have patients with many aches and pains that could be prevented and FIXED if they just drink enough water. It seems like it’s an easy fix to just drink more water, yet many of us overlook the importance of replenishing our body daily. Dehydrated muscles have a certain feel and could be described as more tight and taunt than that patient’s usual state. The skin also can feel very tight. 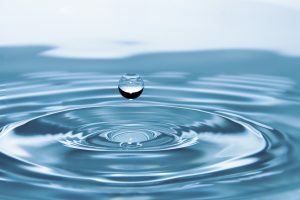 It can be very difficult to repair and restore normal function when one is dehydrated so water is always at the top of my “What else you can do to help get better faster” list. So just how much water should you drink??? My rule of thumb for how much water to drink is simply this- Drink half of your body weight in ounces. For example- if you weigh 200 lbs, you should drink a minimum of 100 oz of water per day. If you work outside and it’s summer, you will need more water than your minimum. If you have been treated by Adair Chiropractic with A.R.T. and muscle work, then you’ll need more water than your minimum! The release we perform on muscles, tendons, ligaments, nerves, and fascia pushes the water out of the cells and it needs to be restored. Drinking water after your visit ensures that you will be less sore as well. EVERY tissue in your body needs water. Did you know that even your BONES are 31% water!!!! 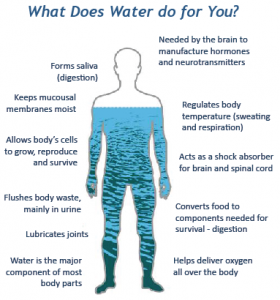 Our body thrives on water! If you are being seen at Adair Chiropractic to fix a soft tissue problem, or a sore back or neck, it will be a LOT harder for healing to occur if you are dehydrated. It will take LONGER too! Keep water by your bed and drink 2 full glasses right away. It will be easier to drink that much in one sitting first thing in the morning than later in the day. Flavor it with fresh fruit like strawberries or any berry. It’s also refreshing with cucumber slices. Yum! Buy a special carafe or pitcher to make it easy. Get a fun insulated water bottle (or 2) in your favorite color or a print that makes you smile. Shop here for my family’s favorite water bottle. Now, go fill up that glass again and drink up. Your body will thank you!